Airtel is always in forefront as a partner for launching new technologies and mobile devices in India .We recently covered the launch of first Android poweredHTC magic from Airtel . Now Airtel and RIM Canada have came with Blackberry Curve 8520 in India .The major attraction of Blackberry Curve 8520 is that its price is lesser than other Blackberry models .This middle placed Blackberry device has a combination of Blackberry business features and multimedia facilities . Blackberry Curve 8520 is well suited for young office going professionals and students . Blackberry Curve 8520 specifications includes 2 mega pixel camera ,wide screen display ,QWERTY keypad and the renowned Blackberry internet services . Blackberry Curve 8520 will also be able to sync with Apple machines after the launch of the software that is expected to be announced soon. The pricing of Blackberry Curve 8520 is yet another move from RIM for a mind transformation of people from thinking Blackberry as only a Business phone .The BlackBerry storm was a good multimedia phone .But the pricing and some interface and WiFi connectivity issues limited itself only to the top class customers .Blackberry Curve 8520 is suitable for everyone who is looking for an avarage smartphone with internet and office productivity . Blackberry Curve 8520 comes with a 2.64 inch 320×240 pixel screen displays over 65,000 colors . Blackberry email and instant messaging. Offers 4.5 hours regular talk time and 17 days standby time . Access to Blackberry app world and social networking websites . Being a Business phone , Blackberry Curve 8520 needs an internet connection ton access mail ,media a,instant messaging and other Blackberry corporate services .Airtel has announced a prepaid tariff plans for Blackberry services . In the first plan internet is limited to mail ,search and some other websites .For full Blackberry Curve 8520 internet experience , you would need to to choose the second prepaid plan from Airtel . 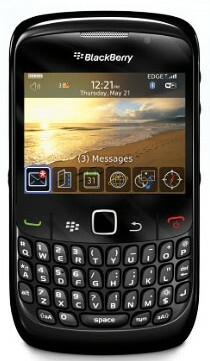 The current Indian price Blackberry Curve 8520 is INR 15900 excluding taxes .The phone is now only available with Airtel . Pls advise prices on above mobile Phone With shipping charge.